Designed to mount on broadcast and prosumer cameras that supply phantom power, the Azden SGM-PDII is a mini (5.9" / 150mm) shotgun microphone equipped with a hardwired XLR output cable. It features a supercardioid polar pattern and a low-noise circuitry, and is ideal for capturing focused audio in various indoor or outdoor environments for film, broadcast TV, and other video applications. The SGM-PDII operates on 11-52 VDC phantom power. It delivers an 80 Hz to 18 kHz frequency response and handles sound-pressure levels up to 120 dB for close-miking. Handcrafted in Japan, the mic ships with a shockmount, a flocked-foam windscreen, and a zippered carry case. 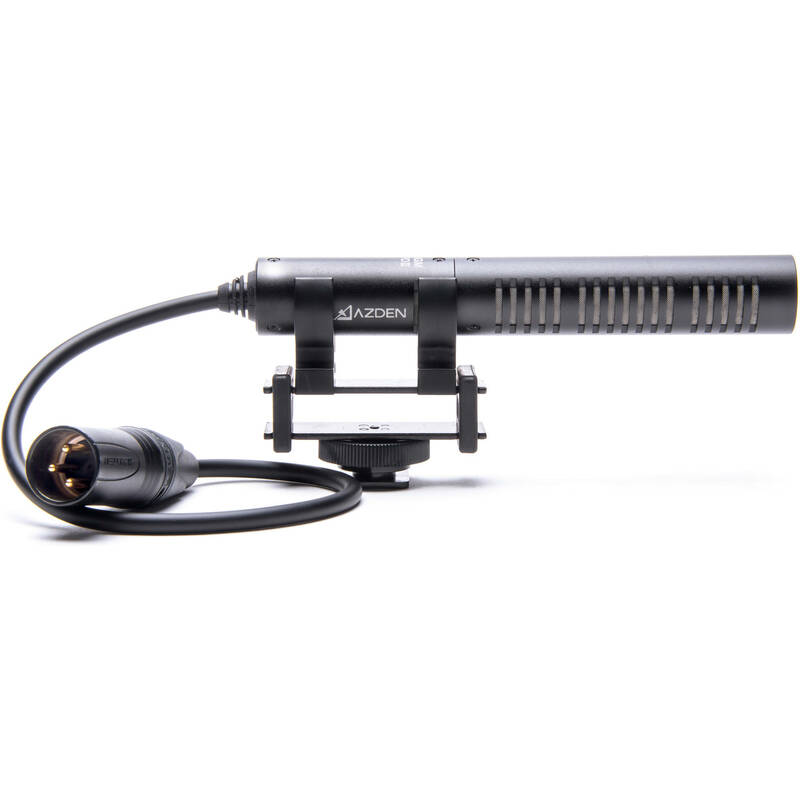 Box Dimensions (LxWxH) 10.787 x 3.701 x 3.307"
SGM-PDII Mini Shotgun Microphone with Wired Output Cable (XLR) is rated 4.5 out of 5 by 60. Rated 2 out of 5 by Rudy from Serious disappointment I originally had a Canon Vixia HF21 consumer video camera with a Canon DM50 directional microphone. I decided to move up and purchased a Canon XF105 video camera and bought the SGM-PGII microphone because of its shorter length. When I tried this microphone I realized that I had taken a serious step DOWN over the DM50 I used on my Vixia. The tone was flat sounding and the microphone seems to pick up all kinds of ambient sounds. Considering the money I paid, this mic was a serious disappointment. I talke to a B&H sales rep and they suggested a Rode NTG2. I bought that and will conduct tests on it shortly. Rated 5 out of 5 by Anonymous from Performs above expectations. I bought this Shotgun mic the day before a trip to Africa for videotaping landscapes, wildlife and conducting interviews. About me: I'm new to the world of video, so keep that in mind when reading this review. The shotgun mic sound quality is excellent, and directional sound pickup is great. It mounted solidly on my Canon XHG1, and was a plug-in-and-go solution for me. I'm impressed that it's got a little shock absorption section as part of the mount to help curb vibration. I'd encourage anyone (especially first-timers who are looking for a simple, high quality audio setup) to go with this mic. Rated 4 out of 5 by richardls from Not bad for the price tag. I use this on my video camera to capture natural sound in addition to using a lav mic on a subject. I love this mic, because for what I do, it is nice to have a cable built into the mic so I am not hauling another one around with me. I have a shock mount on my camera so I haven't used the one that comes in the kit, so I have no info on that. The flip side is, you are getting what you pay for. It is not the best quality ever, and I would not put it on a boom pole to record someone's audio. For run and gun though, and if you don't have a lot of cash to throw around, it is not a bad buy. Also, the mic require that you use phantom power, there is no provision for using a AA and there are no filter options on it for low or high pass. Again, you get what you pay for. I would still recommend this to a friend because it is reliable and sturdy. My only quibble is that it doesn't have some of the feature of the more expensive microphones out there. But its not like that is hidden, its just something to think hard about. Rated 5 out of 5 by kmk802 from Excellent I am a freelance filmmaker and use this mic on every job. Once and a while I find myself in less than ideal audio situations and can't believe how great the audio turned out despite the wind, air conditioner, background noise, etc... The quality is excellent and the price is even better. Recently I shot side by side with another filmmaker who had a MUCH more expensive shotgun mic on his camera. I edited the footage together and the quality difference was outrageous, mine was SIGNIFICANTLY clearer, I couldn't believe it. He had picked up every little background noise and a general background buzz. Mine was crystal clear. I have used this for a variety of projects; web videos, short films, commercials, promos, etc...Don't fall for the sales pitch that I almost did. I was close to breaking the bank for a mic twice the price...so glad I didn't. My next purchase is 2 Azden wireless lavs, I trust the quality completely. Rated 5 out of 5 by Kris V. from Amazing Sound First, I have to say I don't have another shotgun to compare this to, nor experience with shotgun mics in general-- this is my first one, but for the size (short), weight (light), and sound quality (excellent), IMO it's a five-star. I looked at several others on-line, and this one seemed the best combination for the price, especially since it's short enough to not interfere/appear in my small camera's (XA10) lens. BTW one thing I wasn't sure about at first was that the cord is permanently attached to the mic itself-- I thought I wouldn't like that since if something goes wrong with the connection, I couldn't swap out another XLR cable myself. That might be an issue down the line (only time will tell), but on the plus side it does allow the mic to be even more compact and judging from the initial build quality (high) I don't think it will be a problem later either. Overall, highly recommended, especially for use on Canon XA10. Rated 5 out of 5 by Focused Video from Great sound at a great price I bought this to go with a DVX100 and wanted something to improve the sound without breaking the bank. I have used the mic a few times now and am very please with the sound. It is compact and easy to use too. I was also please with the clamp mounts that are design to help absorb vibrations. And the windscreen that was included was adequate as well. The device seems overall well thought out and reliable. Rated 5 out of 5 by Anonymous from Works Great Works great with my XA10 camera. It was smaller in diameter then the external mic holder on my XA10 but it came with a rubber spacer that made it fit. Rated 5 out of 5 by Carlos Filho from small mic, great sound Simple and small, but it works great ! I just recently bought this mic and the sound is amazing! But the wind screen that came with it doesn't exactly do very much in an actual windy environment. Is there a nice furry wind screen that can block the wind and that will fit on this mic? Azden SWS-100 High Performance Softie WindscreenB&amp;H # AZSWS100 The Azden SWS-100 High Performance Softie Windscreen is intended for use with the Azden SGM-PDII, SMX-10, and ECZ-990 microphones. The softie delivers optimum wind suppression and is ideal for use outdoors. Can the shockmount be easily removed? Or is it intended to remain one piece? Could, or should I use this mic on my Nikon D810 despite the XLR connector? This microphone requires phantom power and cannot be connected directly to your camera. I have an Azden SGM-1 mic and a Canon XF 100 Camera...which cable do I need? And what is the minimum length (I will be filming outdoors and on the move don't need much or so I don't think)...if so what item# so I can order it? Thanks!